The justification given by SAPS, that they opened fire on mineworkers at the first killing scene on 16th August 2012 because they were under attack, has been blown out of the water. This follows discovery of a SAPs hard drive containingdocuments that SAPS deliberately concealed from the Farlam Commission of Inquiry. New footage has been released by the Marikana Support Campaign showing mineworkers peacefully leaving the koppie on the 16th and attempting to make their way back to the informal settlement, Nkaneng. The footage shows police cocking their guns in readiness to shoot. The evidence shows the police were not under attack. Evidence leader Mathew Chakalson put it to Col. Scott that the police presentation given the day after the on the 17th August 2012 by himself, a document the evidence leaders discovered on the police hard drives was the truthful version of events, which corresponds very much to this footage released. 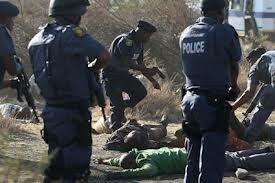 Marikana massacre: SAPS, Lonmin, Ramaphosa & time for blood. Miners’ blood. THE government should act on social problems and environmental degradation caused by the actions of companies such as platinum miner Lonmin that are “destroying lives of voters”, church-based nongovernmental organisation Bench Marks Foundation said. Lonmin was thrust into the spotlight in August 2012 when 34 striking workers at its Marikana mine in the North West were shot dead by police and 78 injured. “If the relationship between mining houses and the government was honest, the government would be saying, ‘What are you doing to the water? What are you doing to the air?’ and not hesitate to take away their licences,” said Bench Marks CE John Capel. Bench Marks Foundation, an independent NGO owned by the churches in South Africa, is considering undertaking in-depth analyses of the sustainable development reports (SDRs) of other major mining companies following its unprecedented analysis of nine years of Lonmin’s SDRs. Such an exercise would not only be of considerable benefit to stakeholders in mining companies, it would significantly enhance general awareness of sustainability issues at all levels in the investment chain, from pension fund member to trustee and, eventually, to the pension fund manager who makes the decision on whether or not to invest. Bench Marks’ Lonmin report and a recent report on the pension fund industry’s dismal commitment to socially responsible investment reveal that 20 years after the first King code on corporate governance there has been little change in the all-consuming focus on short-term profits and share price by corporate executives and institutional investors.